The Budapest Basilica Christmas Market only launched in 2011, but in 2012 the fantastic Advent fair and Christmas market is making a spectacular return in 2012. The fair is not to be missed, and it is conveniently located in the city center! You don’t have to be a gift hunter for traditional Hungarian Christmas gifts to fully enjoy the wonderful Christmas market atmosphere right in front of the biggest cathedral of Budapest, the 96 meter tall St Stephen’s Basilica. Just take a mug of mulled wine, roasted chestnut, grab some warm, juicy and hearty street foods (well beyond sausages), and enjoy the winter festival of Budapest: Budapest Christmas! Similarly to the displays on the nearby – and more famous – Budapest Christmas Market on Vorosmarty Square, the items for sale are beautiful handcrafted, high quality goods, which can make a perfect souvenir or special Christmas gifts for your loved ones. at half past 5 from Monday to Sunday, every day (exceptions below!) 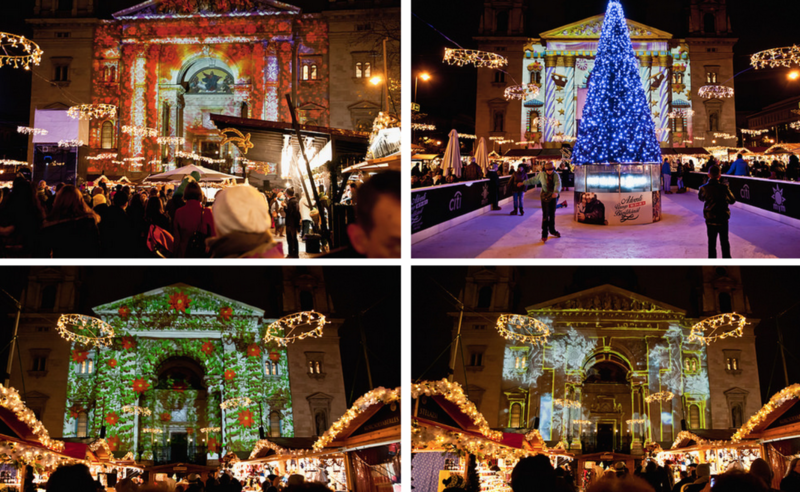 festive lights are projected on the walls of the St Istvan Basilica with accompanying melodies. Be there on the Christmas market at 5:30 and enjoy the Christmas sights. Flags or Birds? 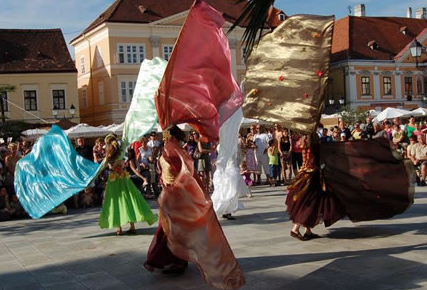 What are these flying dancers with poles and huge sheets of silky sheets? A special performance at the Budapest Basilica Christmas show is the “angel dance” of Middle-East origin. It has great traditions in many European countries too, but it is new to Hungary. The dancers have huge wings on sticks and with the colorful swirling of them they can tell you beautiful stories. They put you in a special mood merging components of classical ballet and that of belly dance. The impact is similar to the show of “flag throwers”. Children and adults can test their reflexes, adroitness, endurance and balancing skills. Many juggler tools are presented to the visitors like simple balls, maces, poi, devil’s stick, long stick, yo-yo, diablo or contact ball. These tools, exercises and techniques can develop the general movement coordination, sense of balance and physical condition not even to mention the joy of playing and experience of success. Skating rink in the heart of the city? In front of the Cathedral? On a Christmas fair? You are right. Budapest is a unique place with unique ideas. And why not? On weekends from Friday to Sunday children under 14 years old can skate free of charge. 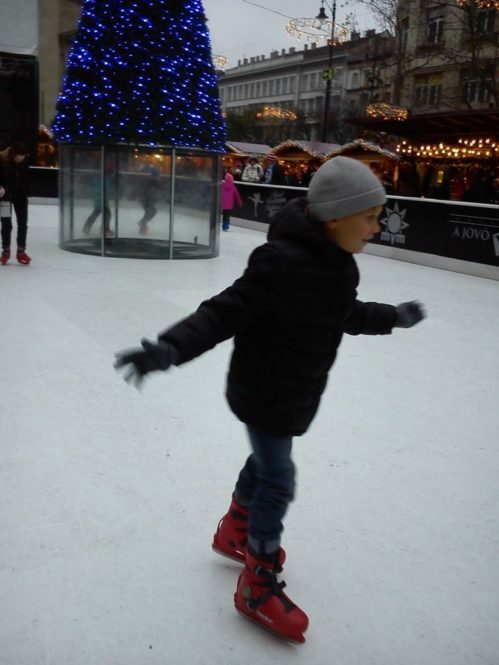 Trainers will help and teach your little ones how to skate. No skates with you? You can rent them on the spot (rental fee is charged). Society of Respect presents active elderly at the Christmas market in Budapest at the St Stephen Basilica. After all, 2012 is the year of “active aging” and the solidarity among generations in Europe. In this spirit Hungarian pensioners over the age of 60 show us how it is possible to live an active life in an elderly age. Please donate: the incoming donations are forwarded to Árpád Ódry Home of Artists that helps elder people. December 31., 2012 – Exhibition of new year’s eve piglets, petting piglets that bring good luck. Also the children can enjoy an unequalled experience in the wooden hut of Society of Respect after 5 pm every day because they can encounter with Santa Claus personally! Budapest is a multicultural city with many thousands of Jewish residents who will celebrate Hanukkah in Budapest. Don’t be surprised that you can also try Raj Rachel’s gorgeous Flodni at the Advent Market. Do try this rich Jewish cake at the market. And give Palinka a chance to heat you up a bit, a tiny bit on the chilly days. The best fruit palinkas will be sold at the market, so here is a chance to test the Hungarian spirit (carefully, its alcohol content is very high). 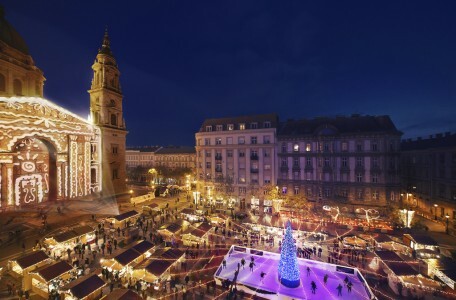 Are you visiting the 2012 Budapest Christmas Market this winter? Are you curious what it may be like? 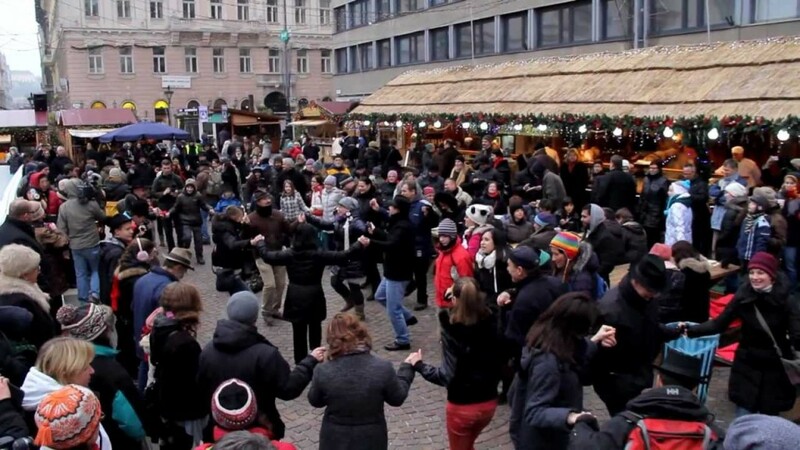 We have gathered some fresh videos of the 2012 Budapest Christmas markets as a teaser. The videos are user made and uploaded videos, but still enjoyable. 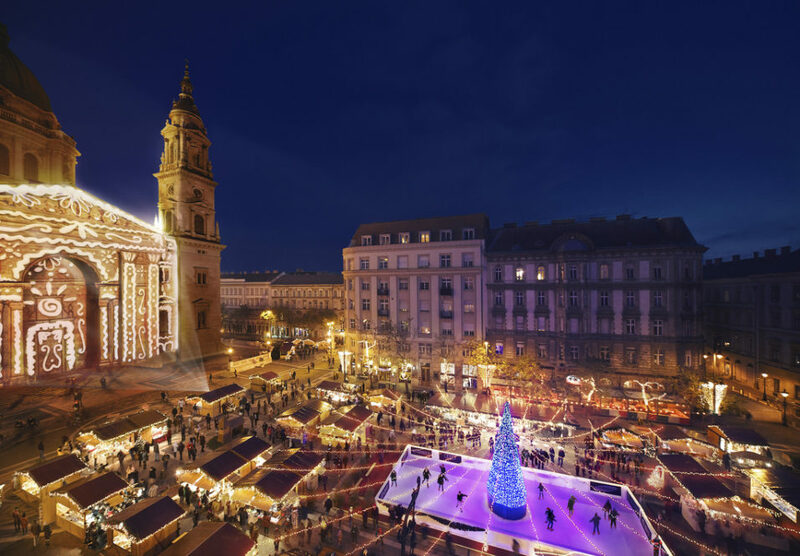 The Budapest Christmas markets tour is simply one of the best tours the city has on offer for visiting the 2 main Christmas Markets and St Stephen’s Basilica in a guided tour, plus having a 3 tier wine tasting in a nice Hungarian restaurant. For a 2.5 hour market tour around a Xmas fairs + the quality wine tasting tour, the price is 48 Euro (child ticket available). Yes, the mini wine tour is included in the price! See the details of the Christmas Fair Tour in Budapest below, and place your booking as places are limited and tour dates may fill up quickly. 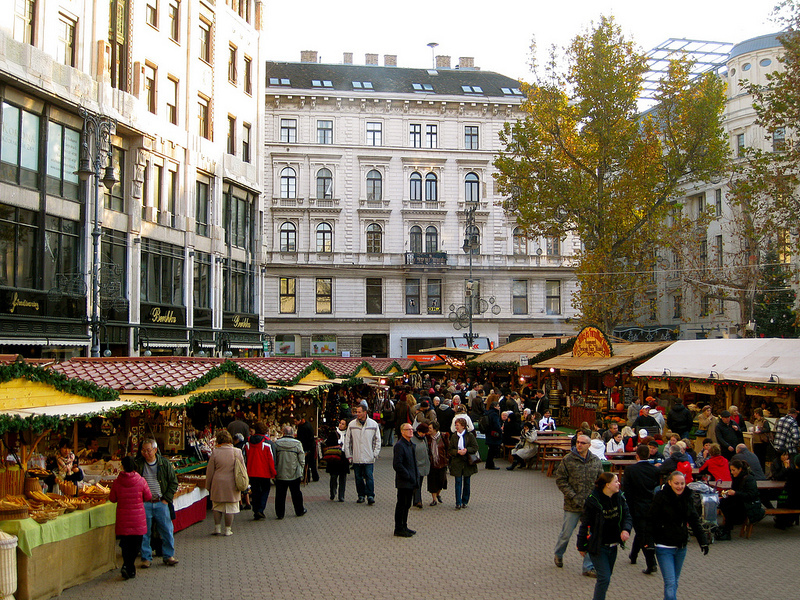 Why Budapest Christmas Market Tour? Guided tour of 2 Christmas markets with a local guide: guiding you around some of the beautiful Xmas markets in Budapest: e.g. Vorosmarty Square Christmas Market, St Stephen’s Basilica Christmas Market. Interesting guided tour, focusing on Hungarian Christmas traditions (just like the Advent markets, which are like nostalgia postcards coming to life). You can enjoy the markets and see the sights, foods, gifts through a local’s eyes, get footnotes and informative guidance about what you see, what you are about to buy or eat. In the 2 Christmas markets you can see the Hungarian handicrafts, trinkets, souvenirs, as well as the local foods and sweets on offer. Along the way you will see the Opera House, Andrassy Avenue, and St Stephen’s Basilica. The Xmas tour ends on Vorosmarty square where the best Budapest Christmas market is (lots of traditional fares), so you can do some holiday shopping on your own – the farewell gift is a Mug of Mulled Wine to keep you warm while you are browsing on the Christmas Market with its hundred and more vendors, great concerts (free concerts on the Christmas Market stage!). Vorosmarty square is where the major shopping streets, Vaci utca, and the Fashion street leave from, where many shops can be found for a more modern sort of shopping (Zara, Mexx, Lacoste, H&M, Benetton, Tommy Hilfiger, etc.). The Christmas Market sprawls into these streets, which are all beautifully illuminated throughout the Advent period. Wine tasting (3 tier): there are several wine tasting tours in Budapest, and the Christmas market tour does an excellent job considering its main focus is combining the Xmas fair sightseeing with a wine tasting tour rather than offering a stand alone wine tour. 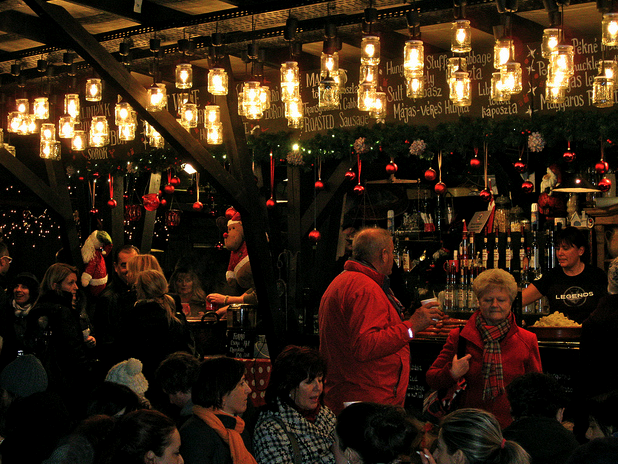 The price of the Christmas market tour includes 3 glasses of wine (and at the end of the tour, 1 mug of mulled wine). Gluhwein is the most popular drinks of the winter markets of course. Min age for wine tasting: 18 years old (the legal age in Hungary), but participation in the tour is for all. Halfway through the Budapest Christmas Market tour you’ll take shelter from the cold, and relax a bit while sipping away famous wines from Hungary. 3 top tier wines are included. The whole tour is family friendly (free for under 2, 50% discount for children under 13). It is a perfect family program with bigger children, but do make the kids wear warm clothes, coats, hats and boots for the tour to avoid getting the cold. Included in the price: the guided tour in the 2 major Christmas markets, inside St Stephen’s Basilica, and 3+1 wines, small group professional guide. Not included: Foods, gifts are NOT included in the price of the Xmas fair tours (nor is a tip for the guide). When are the Budapest Christmas Market Tours? The Budapest Christmas markets tours start each day at 2.30pm and finish at 5pm from the beginning of December till the end of December. Available dates (can be checked on the booking page): some of the dates have already been booked up, and on certain days the tour is not available. See the calendar of the Christmas tours in the booking form (the little calendar icon shows the available dates). TIP: Please note that the wooden stalls selling hand crafted Christmas gifts are only open until 2pm on Dec 24. This is usually the last day for selling Xmas goods and gifts on Vorosmarty Square, then mostly only the gastro stalls remain open selling Hungarian drinks and street foods. Please use our booking form to make a reservation for your Budapest Christmas Market Tour. After booking you will get an electronic voucher, and this is what you will show your Christmas tour guide to prove the payment. You can also print the e-voucher on a paper but this is not necessary. You have two options for the tour regarding proof of payment, you can use paper or digital vouchers to present. The supplier of this tour accepts both printed and electronic vouchers (e-vouchers). You can either print the voucher and present a paper copy on the day of travel. Or, if you travel with a mobile device, simply show your voucher on your Smartphone or tablet on the day of travel. What to wear at the Budapest Christmas Market Tours? 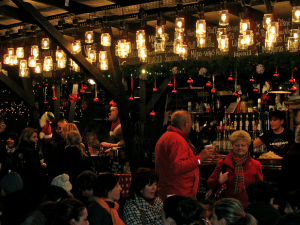 Do get dressed warmly as spending 1-2 hours outside at the Christmas markets can be chilly. 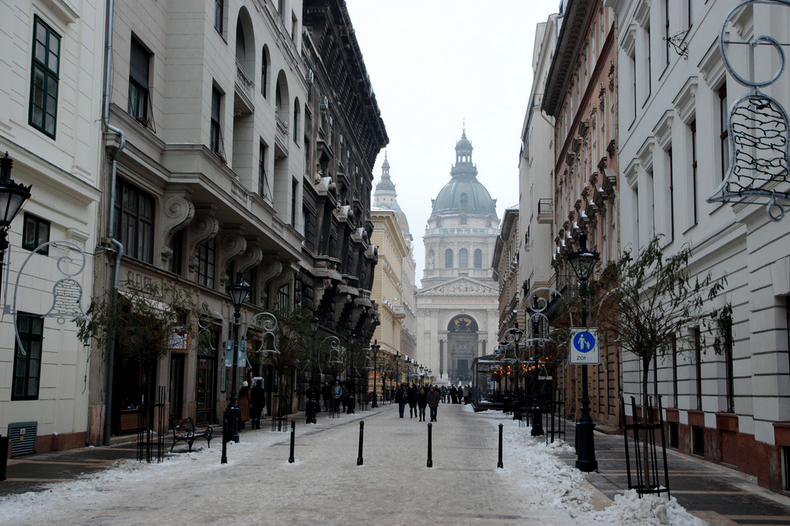 The winters are cold in Budapest, you will need boots, or warm and waterproof shoes (ideally some kind of goretex waterproof walking boots, or comfy water repellent shoes), hat, scarf and gloves will come in handy on windier days, and a good warm coat is also necessary. 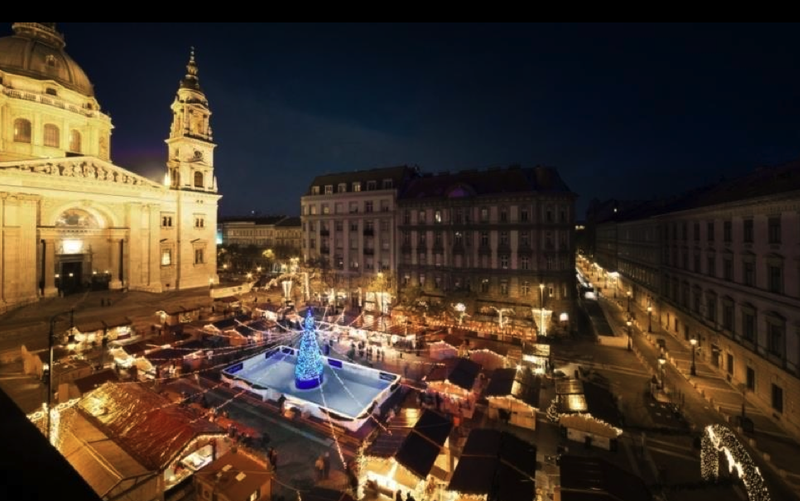 The Christmas market on St Stephen’s Square is right in front of the beautiful St Stephen’s Basilica (St Istvan Bazilika), one of the tallest buildings on the Pest side of Budapest, and one of the biggest churches in Hungary. 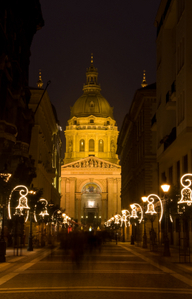 The first Advent Fair by the St Stephen’s Basilica was held in 2011, organized by the National Association of Folk Artists. The skillful members of the Association of Hungarian Folk Artist are selling their unique and high quality traditional crafts (rated by the panel of the best Hungarian folk artists) in the wooden market stalls of the Basilica Christmas Market. Entering the giant Advent gate, you will find yourself among a hundred handcrafts stalls, and a sizeable skating rink set up on St Istvan Square (Szent István tér) in the heart of the city of Budapest. 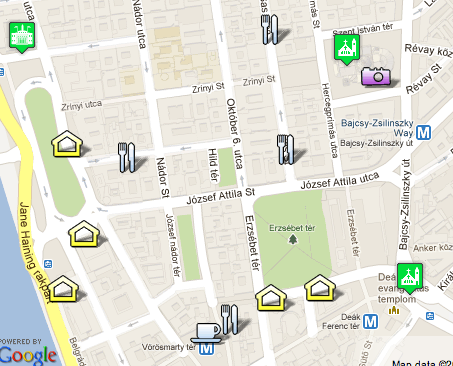 Where is the Budapest Basilica Christmas Market? Luckily, the location of the Basilica Christmas Fair is very close to the oldest and most well known Christmas Market on Vorosmarty Square, so you can easily visit two of the biggest and most popular Xmas fairs of Budapest during the Christmas holidays. 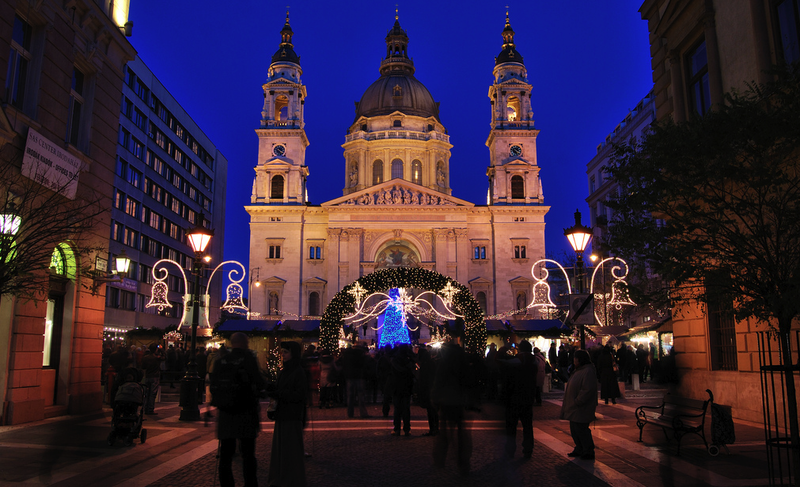 When is the Budapest Basilica Christmas Market? The Budapest Basilica Xmas Market is in fact a winter festival, which starts in late November, and ends in the New Year. The Christmas Market by the St Stephen’s Basilica opened late November in 2011 (its very first year, started in 2011), a bit later than the fair on Vorosmarty Square (running since 1998). 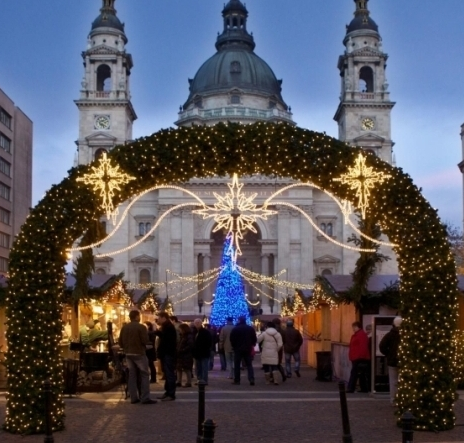 Similarly to the latest years, the St Stephen’s Basilica Xmas market will be open throughout December. 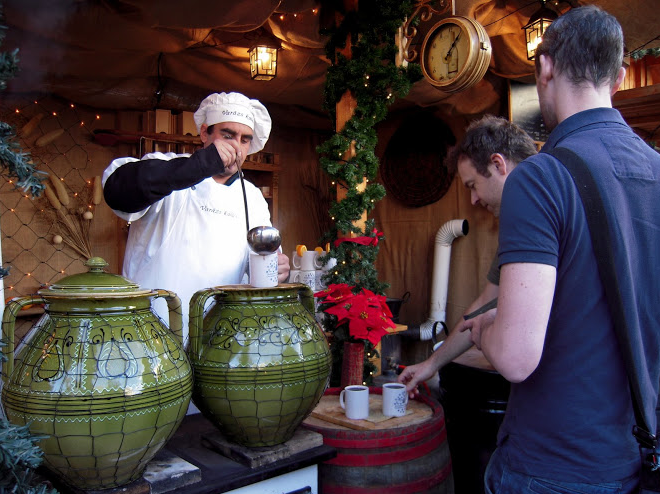 Drinking mulled wine, eating some roasted chestnuts or filling Hungarian snacks attracts hundreds of thousands in Hungary and tourists from many countries. In every hour, every day between 4.30 pm and 10 pm you can see the Basilica’s facade turning into a beautiful Christmas visual narrative. This year’s special attraction will be a 3D projection on the Basilica, that can be viewed from all corners of St Stephen’s Square with 3D glasses. Enjoy the artificial skating rink right in the middle of the Christmas Market at the Basilica in Budapest downtown. Skating courses also available every Friday, Saturday and Sunday. The age range of the course is 4-14 year old children. The price is not a question: they may join the free skating training on the nicely decorated rink at the center of the market. 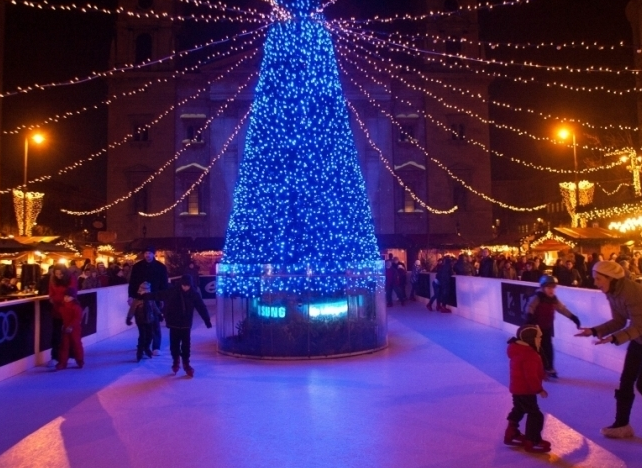 From the beginning of the Basilica Advent market, you can use the skating rink. Skating Class Hours: Friday from 2-8 pm, Saturday from 10am-6 pm and Sunday from 10am-6 pm. Free Skating Classes for children aged 4 – 14 years old. 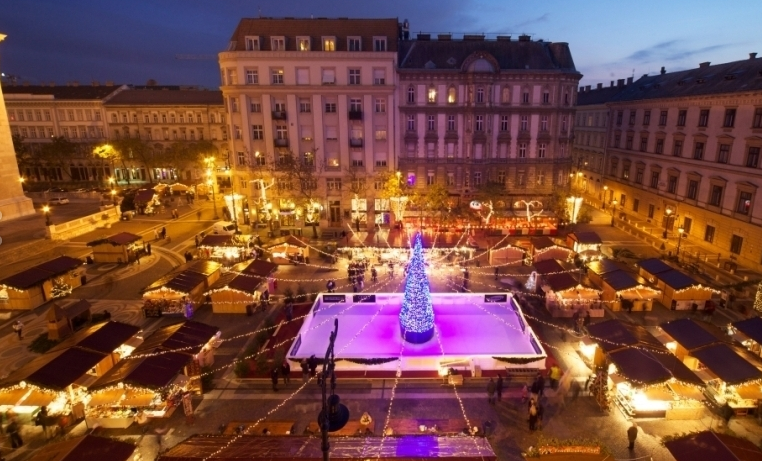 Wrap them up in warm clothes and let them enjoy the Advent Market in Budapest! Every Friday and Saturday in the evening (starting 24th of November), the Goncol Folk Dance Ensemble, who aim to keep traditions alive and show its beauty to each generation, will give twenty minute shows. They either improvise a ‘dance house’ that all the guests of the fair may join or surprise the audience by vivid flash mobs. Do join the dancers on Fri and Sat to try your legs at Hungarian folk dance. 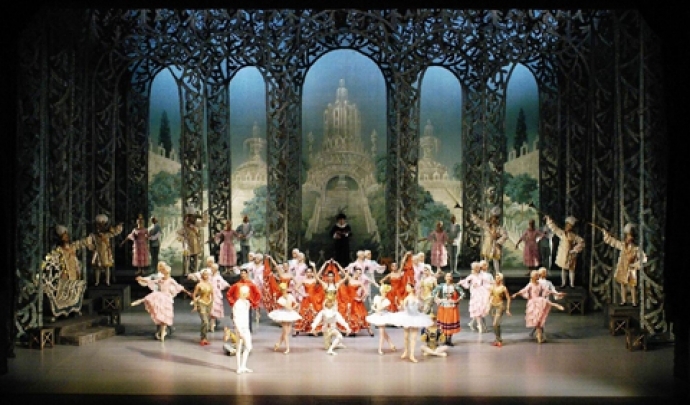 Or enjoy a festive Hungarian Folk Dance Show in Budapest in the winter season. In fact, Budapest has often been chosen as one of the best Christmas destinations in Europe, and the Christmas markets are warmly recommended by many of the travel books about Europe and (Central) Eastern Europe. Don’t worry, although some places are closed on Dec24-26, many places remain open, and many of the best places: restaurants, brunches, baths, sightseeing river cruises, etc. There is a lot to do in our cosmopolitan city. You can be the part of this festive merriment. Come and visit Budapest and listen to the beautiful concerts in the Basilica (Advent Organ concerts, choirs, charity concerts, etc.). 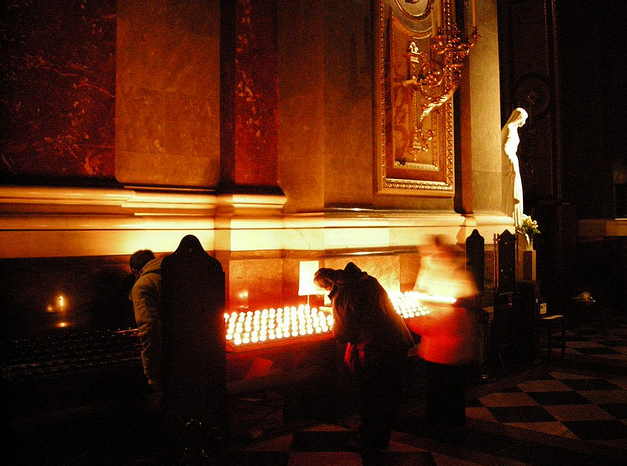 You can also attend the masses, light a candle, and be filled with the warmth of Christmas. 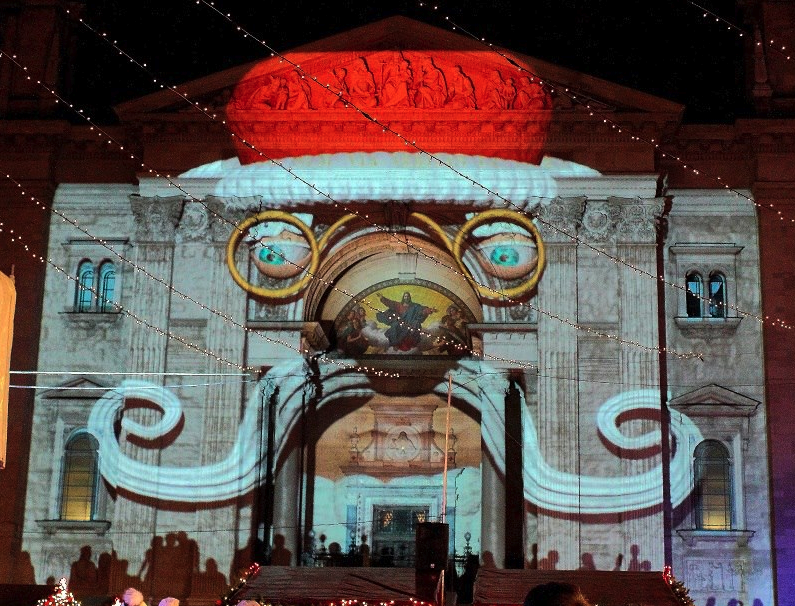 The light painting show was specifically designed for the St Stephen’s Basilica in Budapest for the Christmas festivities. 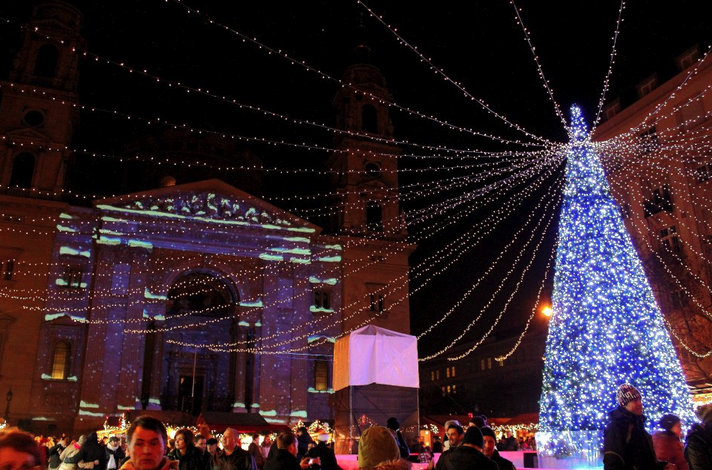 The 3D projection laser ray show was part of the first Christmas Market at the Basilica in Budapest (Szt Istvan Bazilika) organized in 2011. Light painting has been popular in Hungary for the last decade or so, but only in 2011 did the Christmas markets in Budapest discover it as a means of celebration and festive entertainment.